Welcome to BaliHai Resort & Spa ! BaliHai Resort & Spa is centrally located in Tuban, near Kuta, on 3 hectares of lush, tropically landscaped gardens and is on Tuban's white sand beach with a commanding view of the Indian Ocean. With a complete array of facilities and conveniences, BaliHai Resort offers good value for a fun filled vacation. 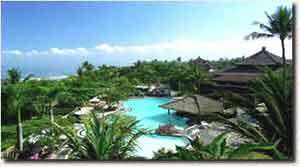 Balihai Resort & Spa offers 200 luxurious guest rooms, Balihai Suites and Villas with private pool. Besides the large swimming pool near the beach, BaliHai Resorts & Spa has four restaurants and bars, offering a wide variety for dining. In addition to swimming, facilities include tennis, fitness, massage and various water sports. The supervised Kiddy Club provides day long activities for children from 4 to 12 years, so parents can relax. Guest will enjoy the Balinese friendliness at high international service standards, as BaliHai Resort & Spa offers the unique 100%% satisfaction guarantee. The fact that guests keep coming back to the seven year old resort means that the Holiday Inn is the right choice.